The British Guild of Travel Writers, in association with Traveller magazine, is holding their third annual travel writing competition for new writers. 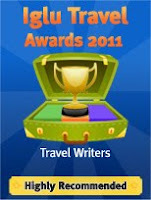 Only those who have not been published in the travel field are eligible to enter. Entrants are advised to submit an 800-word article with the theme A Revealing Journey. "It could be about the journey itself, or being in a destination, that awakened your senses and emotions. Alternatively it could be about your travels as a reflection of a personal journey you have made. Either way, make travel in a destination, or the journey to get there, central to your story." For full terms and conditions, head over to the British Guild of Travel Writers' site.